The start of the New Year is always prime time for employers to look for and hire new talent. So how can you be best prepared? Do your research. Visit the website of the company you’re interviewing with and understand their history, management, and overall business. Be sure to research any of their recent announcements so you’re up to speed. Your attire. Always dress business professional, unless specifically told otherwise. Be clean, well-groomed and scent-free. Your questions. Consider who it is you’ll be speaking to and prepare questions in advance on a single sheet of paper. Your questions should reflect your interest in and research of the employer and its markets and competitors. Your answers. Prepare to be asked questions that can be answered with an example from your past work. Sometimes it can be helpful to review a list of “most likely to be asked” questions and think through how you’ll answer with examples to support your answer. Your body language. Even before you speak, your body language will have told a story about you. 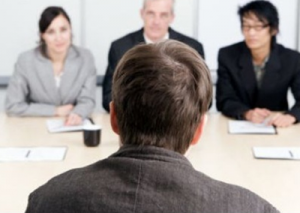 Think about appropriate body language for the interview: a confident smile, sitting and standing up straight, walking confidently, a firm professional handshake, positive eye contact, etc. Your portfolio. This includes all of the materials you need to bring with you to the interview. Use a professional-looking leather portfolio. Include original copies of your resume (bring three more than the number of people with whom you are scheduled to interview). Make sure you have a datasheet with all the details to complete a job application (if required). Your phone. Shut it off and if at all possible don’t bring it into the building with you. It is a distraction at best. Your focus should be on your interview alone. Use waiting time to glance over the materials in your portfolio. Your arrival. Get directions in advance and confirm the location. Plan on arriving to the employer’s parking lot at least 15 minutes early. Be in the waiting room 10 minutes early ready to go. Your one-minute introduction. This is a crisp, naturally-delivered one-minute introduction of who you are and why you are interested in meeting with this employer. Often called an elevator pitch, it should include your top three strengths and how you are looking to put them to work for your next employer. Call out your accomplishments. This may could include successes at previous jobs and or activities you excel in. This could include participation in charities or the ability to speak a second language. Being bilingual demonstrates a valuable language proficiency and can uniquely separate you from the other candidates who may not be. Having a language certificate proving your skills can prove a game-changer.